Barbara Massey was born in 1912 and lived in the Old Rectory, Eversholt, from about 1922 until 1937. Barbara’s reminiscences were put online recently by her daughter, Prue King, following Barbara’s death in 2008. Prue collaborated with Emrys Williams to pull together Barbara’s Eversholt memories of the rectory and of Boy Scouts in Eversholt. I left school in 1929 when I was 17½ – all prepared to ‘Have a Career’. I wasn’t sure what it was to be! My Aunt (my Mother’s sister) and Uncle had my two brothers and myself and looked after us after our parent’s death. Aunt Patty suggested that I should live at home for a year till I was a bit more grown up, to enjoy country life. I thought this was a good idea. It certainly was a good idea, so good that after the year I had no desire to abandon it. There was lots of tennis, squash, riding and dances galore. Lots of friends, male and female to do these things with – a lovely life in a lovely home with a very dear Uncle and Aunt. It seemed to be the only thing we could agree on and she and my Uncle told me to go ahead. I put out a message that I was prepared to start a Boy’s Club if any of the boys would like to join. I hired the Village Hall, set a date and awaited results. Bearing in mind that ours was a very small rural village (Eversholt in Bedfordshire) it was difficult to imagine what the outcome of this proposal would be. The day came and 12 boys of 11 to 18 years old turned up. I amused or interested them sufficiently for 10 of them to come regularly to a weekly meeting and one day Stan Fleet (our Charwoman’s son) said, “Please Miss, we want to be Scouts”. I discussed this with the Archdeacon, who was the County Commissioner, who decided that as there was no man in the village who could do it, perhaps we should sound out the idea. The final outcome was that I learnt my knots and the Scout Promise etc and the boys did the same. In time we had a splendid enrollment with all the right officials present and all the families. 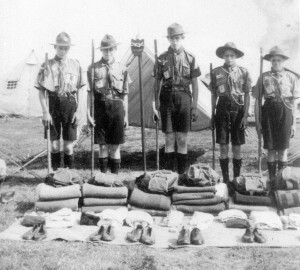 We were the 73rd Beds Scout Troop! Weekly meetings were consistently well attended. The boys worked at getting badges and we went to various local places of interest etc. In the next years we went to various places, Norfolk, locally in Ridgmont, and then Big Adventure, we crossed the sea to Jersey. We travelled steerage to Jersey, actually we spent the night on deck, sitting by the rail, various boys passed us to be sick over the side and in the morning a boy said to me, “Well, Miss, we fetched it up”! By then I had a friend, Janet Hutton, who came with us and was very popular with the boys and when we went to Jersey, Dudley Craig, a friend from Northumberland, came with us. By then we had acquired a Bell Tent, which was our Head Quarters and Janet’s and my bedroom. Dudley had his own tent. 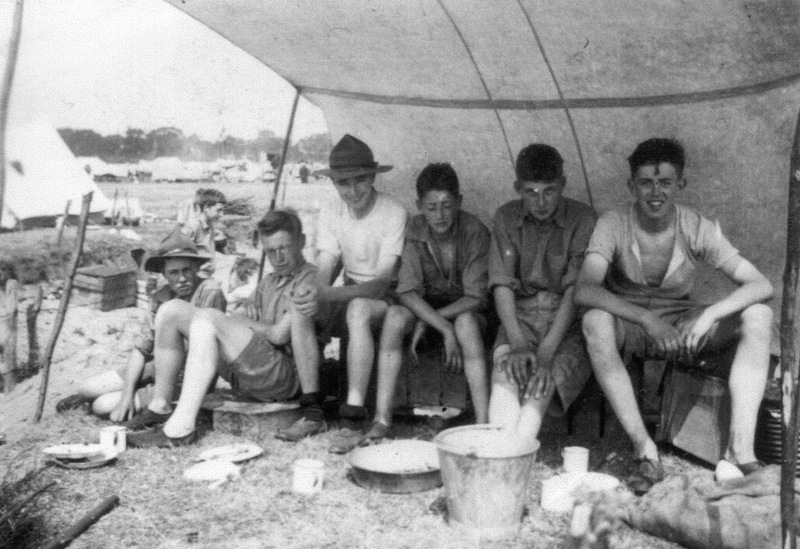 Also with us (I was engaged to Jack by this time) was Jack’s brother Bob and the Duchess’s pilot’s son who shared a tent and there were four other tents for the boys. Jersey was highly successful except for one awful night when we had prolonged heavy rain. After supper Dudley set forth to see if all was well. 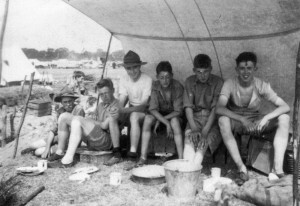 It wasn’t – his tent had collapsed, so had Bob’s and the boys were piled in two tents. Our tent, he told us with much glee was leaning at an angle, with at least four tent pegs out of the earth. He was extremely good and sorted us and the boys and put up his own soggy tent. He then returned to us, having decided he would sleep in our bell tent which we were a bit stuffy about and exiled him to his own damp tent. Another troop camping in the same field had a Scout Master who had the same problems, got pneumonia and died in hospital. Once we had a splendid day out hunting one of the boys who had gone ahead half an hour earlier. I walked along the cliffs which were covered by luxurious ferns. These hid the clefts which one had to watch for carefully. Later in the day we found our quarry and all met and went back to camp. One boy was missing. We all went out again to find him. I looked very nervously down the clefts in the cliffs in case he was a corpse at the bottom. We did not find him and went back to the camp to find he had arrived there – great relief. We got good marks from the County Commissioner for our cooking of a joint of beef. We made a hot fire, then raked it out, put the meat in and replaced the earth and turf on top and went off for the day. What he luckily did not know was the joint was raw six hours later. The air had got in! We did several expeditions and went to tea with the Governor to whom we had an introduction. The boys took all this in their stride. They were becoming seasoned travelers! I never had any troubles with discipline. I was backed by my Uncle who was the Squire of the village and behind him the Duke of Bedford who was the benign owner of a huge estate and owned the villages all round Woburn Park. I remember an occasion in camp when three of the senior boys (probably 19 to 21) asked if they could go to the Pub for a drink. Who was I to stop them, but I stipulated that they should be back in camp by 10:30. I was displeased when they arrived 3 minutes late. The year I got married they decided to go by themselves to the International Jamboree in Holland. There they won the shield for the best camp – Unbelievable! 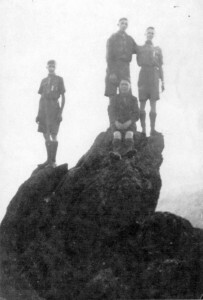 Janet carried on with the Troop until the war started when she worked at Bletchley Park and the Scouts all joined up with the Beds and Herts Regiment. After a bit they were sent to Singapore and arrived the day the Japanese captured Malaya and were all in Prison Camp for the rest of the war. They survived the horrors of the Burma Road and Japanese atrocities and came home to the village when peace was declared. I, sadly, lost touch with our lovely village, Eversholt, and with the boys, tho’ I did get news of them from Janet, who married Alan Barr, the Schoolmistress’ son. I was traveling all over the world, having children and being a Naval Officer’s wife. Many years went by and I had taken up Glass Engraving. I went to a Symposium led by Lawrence Whistler. It was not far out of my way to Cambridge to call in at Eversholt the first time for many years and things looked a bit different. For Instance the Charwoman’s house (Stan Fleet’s Mother) was now a bijou residence with flower boxes in every window, a very different place to the grubby, untidy cottage I knew! I went to the village shop to try to find any of the ‘boys’. I asked for Stan Fleet, no, there was no boy of that name in the village. There was an old man called Stan Fleet but he was 75. As I was 77 of course he was the one! I visited the house he then lived in and we were so pleased to meet again and had a lot to talk about. He suggested that on my way home I should stay at the Bedford Arms in Woburn and he would give a party for as many people of our days he could find. I willingly agreed. The party was great. Stan produced plentiful sherry and I met 4 of the original Scouts and a housemaid (at the Old Rectory) and was the widow of our chauffeur. A lovely party and a lovely hug from Stan at the end. These pictures of scouts were hanging in the Green Man until recently. Who, or when, they are is a mystery. (Click for bigger versions.) Were they taken by Barbara?